Half day or whole day workshops are structured through 50 minute sessions. With up to 20 in a group, participants learn basic techniques, simple melodies, and are encouraged to improvise and express themselves individually and within the group. 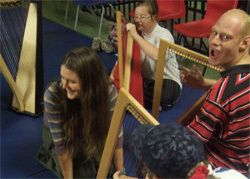 Participants develop musical awareness through the activities, games and tunes, using their communication and listening skills in a fun but stimulating environment. As well as the original Elin y Delyn workshops, I also have an interest in tailor making unique projects to suit the class's ideas and ambitions. Specific parts of the curriculum can be tailored for within group music. Does your school have a theme or project? I work with teachers, ensuring outcomes match the key stage criteria being targeted. I currently have places for classes who wish to have weekly lessons over 6 weeks, a term or a year, perhaps concluding with a performance, recording or composition. Music is excellent at bringing people from a variety of ages and backgrounds together. The versatility of the instrument will surprise and engage even the most reluctant participant. One-off workshops provide a fun and dynamic activity which can be extended to a series of 3, 6 or more workshops by block booking. If you have any comments or questions, please get in touch. Unless otherwise stated all text and images are © Copyright Elin Lloyd 2010.